According to the numbers, about 2,200 hunters go afield for antelope each season. A lot more would-be pronghorn hunters stay home. With 2,075 applicants vying for 125 tags last year, the most sought-after antelope tag was the Steen Mountain hunt. Without a great deal of luck, it takes 12 or 13 years of trying to draw that rifle hunt. Many of the hunts are harder to draw. A hunter holding out for the Hart Mountain hunt will probably have to wait 19 years. For the hunter that chooses the blackpowder or bow and arrow option, an antelope hunt comes along a lot more often. According to the 2013 Oregon Tag Guide, a muzzleloader hunter that applies for the Paulina Unit this year has a 43 percent chance of drawing a tag with only six preference points. The East Fort Rock tag can be drawn with just five points. The odds are even better for the bow hunter. Oregon offers 12 archery antelope hunts this year and last year three of them had fewer people apply as a first choice option than there were tags available. That means a hunter could, in theory, chase pronghorn with a stick and string almost every year. Contrast that with the rifle hunter who has to wait up to 14 years and more between antelope hunts. There were six muzzleloader options in this year's regulations book and two based close to Bend with high percentages of public land available. Bend-based wildlife biologist, Corey Heath said that the intent of these hunts was to offer a bit more opportunity to the archery and muzzleloader user groups without taking away from centerfire rifle hunts in the Paulina Unit and in the North Wagontire. Both the archery and muzzleloader hunts take place after the rifle seasons and run concurrently. "The challenge in the Paulina Unit is locating the antelope," Heath said. "There are a fair number of them north of Highway 20. It is heavily junipered country with not a lot of high spots to look from. We have juniper flats and juniper ridges with little groups of antelope scattered between Bend and Powell Butte." An animal that makes a living in the sagebrush, these pronghorn are right at home in this habitat. The key is finding their water sources. If you don't have a tag this year, use the time to scout for water and look for the little heart-shaped tracks on the trails that skirt the ridge tops. "You will have the place to yourself," Heath said. Only six muzzleloader and six archery hunters will draw tags in the Paulina Unit this year, but most of them, Heath said, will opt to hunt the sagebrush country south of Highway 20, toward Fort Rock, which is more like the typical antelope hunt. Bounded on the west by the Paulina Unit, the North Wagontire hunt starts a couple of miles east of Millican and the open area includes all of the Wagontire Unit north of Lake County Road 5-14. Out in the North Wagontire, the big, low sage flats and playas are home to good numbers of antelope and over the last four years, antelope fawn survival has increased. With mosaics of big sage and low sage and small stands of junipers in 1,500 square miles of pronghorn habitat, Heath says, this section of the Wagontire Unit is managed conservatively and has the reputation of producing trophy bucks. "There are areas where the antelope don't even know there are antelope seasons going on," Heath said. The lucky few that draw an antelope tag this year, can expect a dry summer with little water on the desert. Dry conditions tend to group the animals around the remaining water sources. Oregon's Controlled Hunt application deadline is May 15. 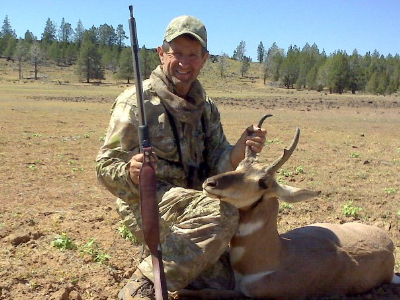 ODFW offers six muzzleloader hunts and 12 archery hunts. With early August and early September starts, the blackpowder and bow and arrow options offer the chance to draw more tags and spend more days in the field.